The European streaming service Viewster has announced that it has acquired Sengoku Basara Judge End for a simulcast in Germany, Austria, Switzerland, Sweden, Denmark and Norway. Their press release states that their simulcast will be "day and date with Japan" and viewers will be able to watch on the Viewster website for free with ads. This is great news; I hope that Viewster will consider expanding their territories for the show if the stream is successful since a lot of regions are still locked out. Please try to watch the official streams if possible (even if you're watching elsewhere as well) to ensure that the series gets good viewing figures! If you want to see the newest screenshots from episode 2, check out the gallery on the second page of the preview here. There are a few minor spoilers for which characters will be appearing so those who are trying to avoid finding out what happens are advised not to look. If you've been curious about the series' two PSP spin-off games, both are currently featured in Capcom's Summer Sale on the Japanese PlayStation Store. I'm sure some people still have a little PSN credit left over after purchasing the game or its DLC, so maybe this will be of interest! Fans who already own the games aren't being left out; they can now transfer the discs to their PlayStation Vita using the 'UMD Passport' upgrade service at a discount too. Mobage is a Japanese social gaming service which used to run the Sengoku Basara Card Heroes mobile game. 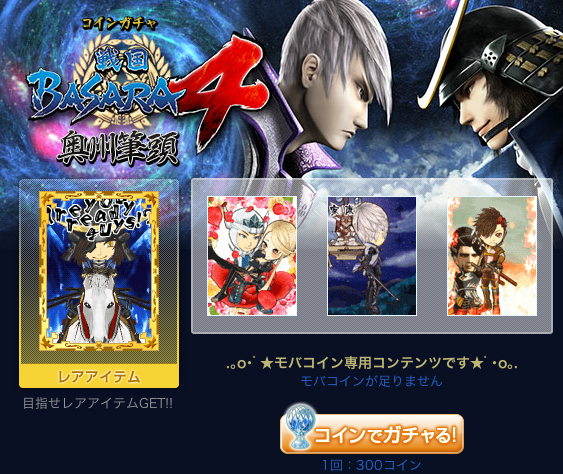 The game shut down earlier this year but the service hasn't stopped trying to appeal to Sengoku Basara fans, and today it was announced that they would be providing Sengoku Basara 4 avatars for use in profiles on the service. They're all really cute! If you have a Mobage account, you can check the new offer here. You have to use the virtual gachapon machine to unlock the outfits, poses and decorations for your Mobage avatar. It costs 300 'moba coins' each time you use the machine though the first one is free. I tried it out and just got the 'Are you ready guys!' text Masamune is showing off below - bah! 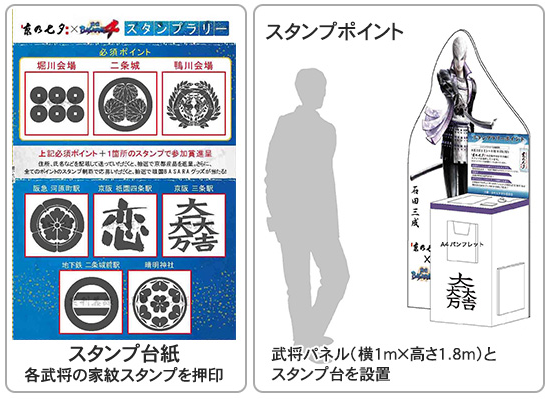 For a limited time between 7th August and 25th August 2014, a pop-store called 'Sengoku Marui: Kitasenju No Jin' will appear in the Marui department store in Kitasenju, not far from the middle of Tokyo. 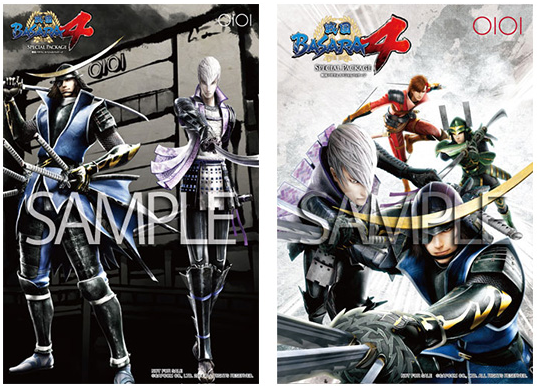 It has been announced that some of the new Sengoku Basara merchandise will be appearing as part of its range of historically-themed goods, and in addition to this shoppers will be offered the chance to obtain two exclusive postcards to commemorate the event. It's almost time for the Tanabata festival in some parts of Japan and Capcom have teamed up with the organisers of Kyo No Tanabata (English website), a celebration of the occasion which takes place right in the heart of the old capital, Kyoto. 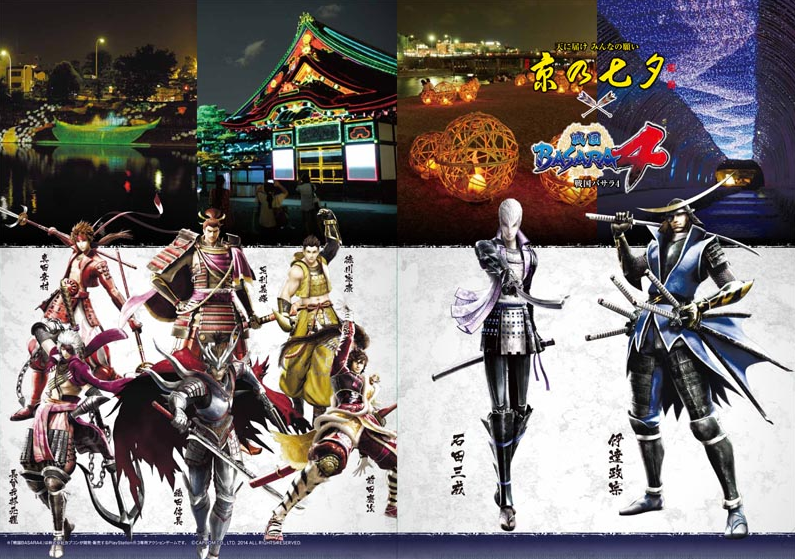 Fans of the series can head to Kyoto between Saturday 3rd August and Monday 12th August 2014 and participate in a stamp rally to earn an exclusive Kyo No Tanabara x Sengoku Basara 4 clear file and other goodies. The prizes each visitor is eligible for depends on the number of stamps participants collect by visiting sites around the central Kyoto area, each of which is guarded by a specific warrior from the series (as pictured below). I'm glad that they got such an awesome avatar design too; Kenshin's cool pose and Kasuga's cute blush are the perfect combination! I just feel so strange spazzing out about them because normally I feel like I'm an unintentional buzzkill in comments sections or something so getting so happy about them just... I dunno. I'm glad I'm not annoying then! And yes definitely! ;_; They're too perfect! No offical UK stream though? Sorry Raindrops. Hoping the official simulcasts will finally go online today so at least some countries can see the show nice and quickly this week! Hurry up, anime industry! We want Sengoku Basara! Simulcast, they said. *sound of crickets* I wonder what's going on....?